This large and bright globular star cluster is the 2nd brightest as seen from Earth, only surpassed by the massive Omega Centauri. Both clusters are Southern Hemisphere objects and are easily visible with the naked eye. Of the two I personally consider 47 Tucanae to the be most impressive because of its extremely dense and bright core region which is a spectacle to behold, both visually through the eyepiece and photographically as in this image. 47 Tucanae is located around 17,000 light years away in the direction of the Southern constellation Tucana (The Toucan) and appears very close to the Small Magellanic Cloud, one of the two prominent satellite galaxies of the Milky Way. The cluster spans an angular diameter larger than the full Moon and is one of the most massive globular clusters, home to millions of individual stars contained within its physical diameter of 120 light years. The cluster consists mainly of old red giant stars with a few very conspicuous blue stars strewn across the field. These are 'Blue Stragglers', stars that are too hot and massive to fit the cluster's otherwise old age. 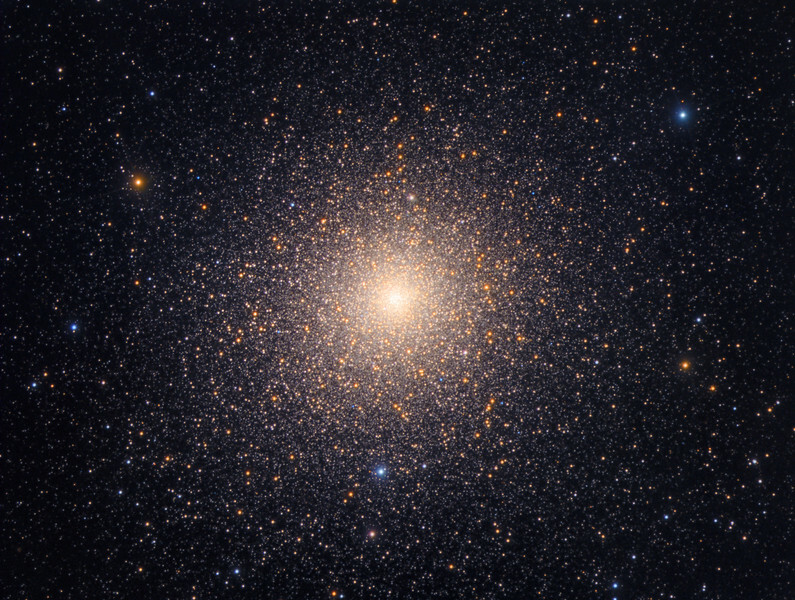 Given the ancient origin of the cluster these stars should by now have turned into red giants but it has been proposed that they are the results of mergers and mass transfers in the crowded environment of globular clusters. A main sequence star can exist for billions of years in the cluster and then at some point in time gain mass from a close orbiting binary, or as a result of a collision/merger, and thereby become more massive and hotter so that it now appears as a blue giant. It is relatively easy to create Colour-Magnitude (H-R) diagrams from LRGB images of globular clusters which show the different stellar populations. Here is a gallery of H-R diagrams I created from some of my globular cluster images in the past.